Conformal coatings are designed to protect circuit boards. They do this by covering the areas that are in danger with a thin film of typically 25-50μm in thickness. This film has been proven to protect the board from the environment around it in many ways. However, the coating is an insulator. Therefore, it cannot be applied to areas that must conduct such as connectors. So, a normal conformal coating material must be applied selectively to the circuit board and this can add cost. Also, the components and areas not coated are unprotected. This means that critical components could be exposed to attack and the board is not perfectly protected. Enter the ultra thin film fluoropolymers. They are applied at sub 2μm thickness. They are hydrophobic and oleophobic so reject water from the surface. The most important characteristic of these materials is they generally don’t need masking on the components like connectors. This is because, since they are ultra thin, they have little mar resistance (resistance to being rubbed) and are easily removed or damaged. 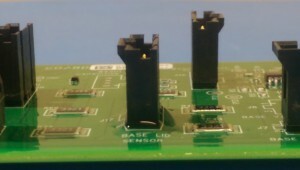 Any coating on connector pads and terminals can be easily removed even in the act of connecting the male and female part together. Therefore, for a simple coating process the whole circuit board can effectively be submerged in the fluoropolymer coating covering connectors and all. Costs for production are extremely low. However, since the coating is ultra thin then handling the board can be quite tricky. This reduces the reliability of the fluoropolymer coating at ultra thin film thickness. So, although the fluoropolymer has a great property of being hydrophobic it is not as reliable as the conformal coating in the long term if subjected to handling etc. So what if we can combine the properties of the two materials and can obtain the benefits of both the conformal coating and fluoropolymer? 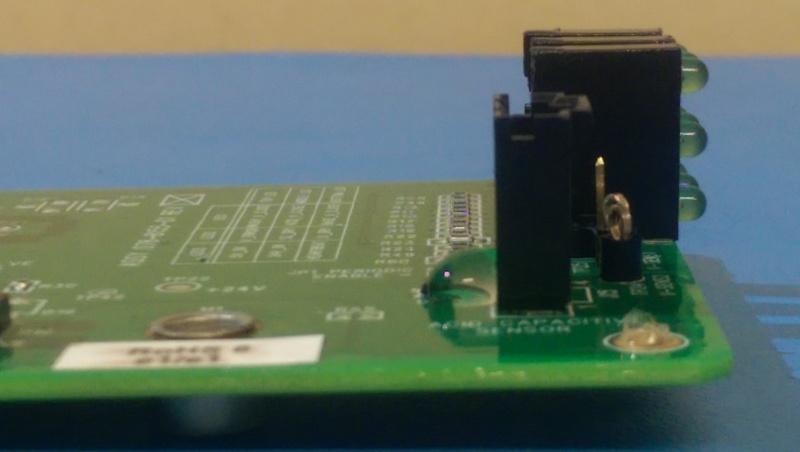 Recently, Nexus carried out some trials with some traditional conformal coatings, an ultra thin fluoropolymer coating and some coupons and scrap PCBs. The results are shown below. What can be seen visually is that the wetting angle for the traditional coating and the uncoated metal coupon were similar. However, where the fluoropolymer was applied then the water beaded more. 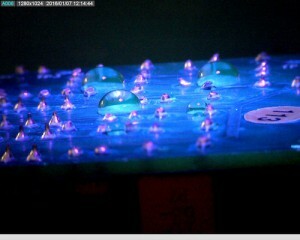 This was also the case for the dual layer conformal coating & fluoropolymer. So, why is this result of interest? 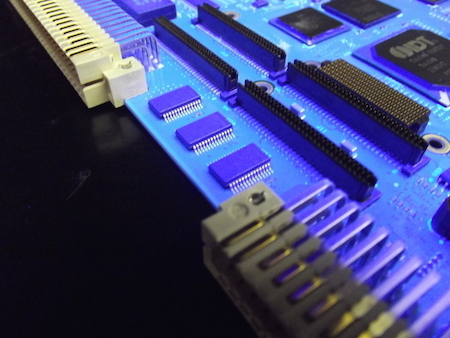 One of the key problems of traditional conformal coating materials is the lack of protection of the uncoated areas. The fluoropolymers did offer the protection to the whole device but offered a less robust system. 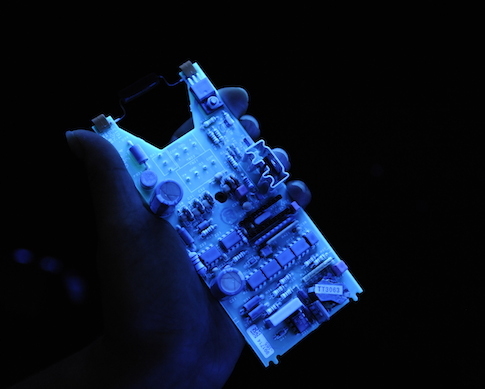 Could a combination of conformal coating & fluoropolymer meet both requirements? Our next basic trials involved scrap circuit boards. For our the first test we coated the circuit board in the conformal coating, with masking applied where required, and then we allowed the coating to dry. We de-masked the connectors and we had a complete, normally protected, circuit board. Next, we re-coated half the board by dipping half of it into a fluoropolymer liquid. After coating the material was dry within a few seconds and we were ready for the test. The results showed with droplets we had the wetting properties of the fluoropolymer on one side and the normal properties of wetting of the conformal coating as expected. No surprise that this was similar to the coupons. 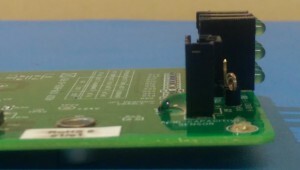 A circuit board coated on the left with just conformal coating and on the right with both conformal coating and fluoropolymer. But, what was interesting was looking at capillary effects around connectors. We next exposed both the connectors with and without fluoropolymer coating applied to them to water droplets. The results showed that the unprotected connectors allowed water to capillary beneath the component body and effectively flooded the connector. However, for the connector coated with the fluoropolymer, the coating repelled the water droplet so the connector inside and underneath the base was also being protected without detriment to the performance of the device. So, what are the potential implications for dual coatings? The fluoropolymer coating could give components protection underneath the devices like QFPs and BGAs and the backs of the legs. This is traditionally a difficult thing to do with conformal coatings and is in fact discouraged under certain devices. The FC coating could also provide protection inside components like connectors and prevent ingress of water and oil during its lifetime. This could be particularly useful for boards exposed to outside weather like LEDs? The coating may help thin tip coverage effects since the dual coat could give a second extra coating, that is also hydrophobic, around the sharp edges. These concepts need to be further investigated. What would a dual coating process cost and would it be worth it? Finally, we have now added an extra process. The key question is are the extra costs worth the protection? In terms of monetary costs, the dual process would be a combination of the standard process costs used for applying the conformal coating in the traditional manner PLUS the costs for dipping into the fluoropolymer and drying. This extra cost for dipping would be minimal in most cases. it takes less than a minute to dip and dry an individual board so mass dipping could reduce costs even further. The real question is will the dual process actually add any extra benefits? I guess we will need to do some more quantitative testing to find out more!